A couple of weeks ago, my 3-year-old son, Max, agreed to let me take him to school by bicycle. This was momentous because recently he’s been insisting that we are crocodiles, and thus incapable of sitting upright. Convincing Max that crocodiles can ride bicycles has allowed me to reclaim an hour of my mornings, which had been spent slowly meandering along the five blocks to Barcelona’s Diputacio Elementary. 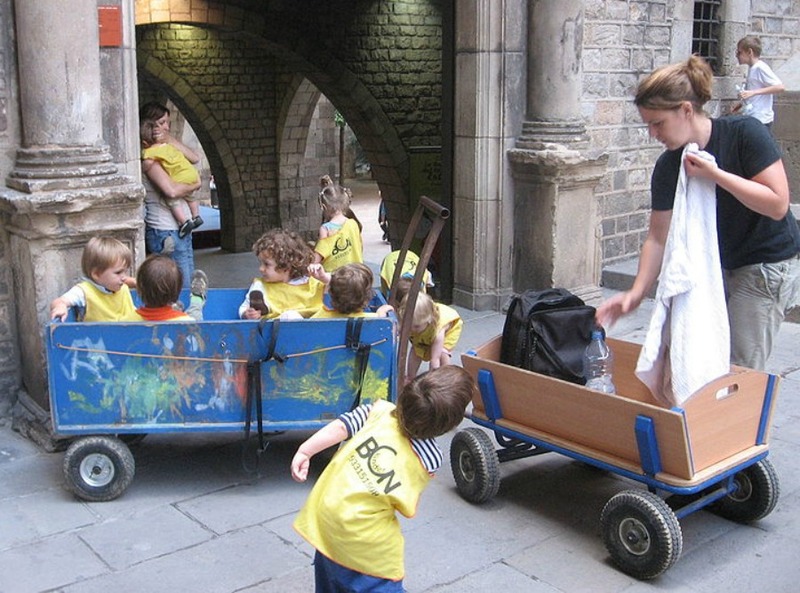 Barcelona is a great place to have a kid. Max is in his first year of free preschool offered at the same primary school he’ll attend to age 12, before heading to one of the public high schools and maybe the $1,500-a-year public university. Add a park every two blocks and free public health care and you have paradise for raising children. Which is what makes it odd that hardly anyone is having any. Anyone except foreigners. When we’re not crocodiles, I am American and my wife is from here, from a Catalan town 40 miles outside of Barcelona. Among her local friends, she is the rare one who’s had a child. Among Max’s friends—the other three-year-olds at Diputacio—our binational marriage seems like a trend. About a quarter of his 26-child class seems to have a similar story: a Catalana mother, and one parent from elsewhere in Europe, Africa, South Asia, or the Americas. At least in our school, children with one parent from abroad appear to outnumber classical migrant families. This caught my eye because Spanish fertility is at historically low levels. Earlier this year, the local census figures showed that women of my wife’s generation—the generation just hitting 40—have so far had the fewest children per capita of any Spanish generation since the 1870s. According to Eurostat, the European Union’s statistical service, Spain has the second-lowest birth rate on the continent. For every four women in Spain there are just five kids. My wife’s mother had three children, which was almost exactly the average for 1975, when four women gave birth to 11 kids. Fertility matters for a lot of wonky reasons—who will pay the pensions? But, lately the conversation in Europe has been less about intergenerational economics than about politics. The trope, flatly racist, is that foreigners come and they breed like an invasive species, imposing foreign cultural norms and draining the public service budgets. The discussion feeds a lot of European paranoia (and increasingly American, too) that lives around the intersection of biology and borders, in which everything from abroad is framed as potentially viral: poverty, extremism, Zika, Ebola. My work as a journalist has me accustomed to hearing these accusations around the edges of refugee camps in Calais, France, and along a border wall dividing the EU from Morocco. But when I come home from those places, I’ve also seen the start of a more hopeful discussion about Europe’s future, by walking into Max’s school. I am not a demographer. Numbers on European migration are easy to get, but a sense of how many newcomers end up starting families with locals is a bit too esoteric a number to nail down, so far. But I see my family fitting into some kind of change. Our social life has broken down by national as well as procreative lines—and that’s turned out to be the same line. Like many new parents, Max’s arrival has meant new relationships with parents of kids of the same age, and more often then not one of them is from outside Spain and usually outside Europe. Our Catalan friends, meanwhile, are the ones we need to get a babysitter to see; they don’t have kids, so they go out later. When we recently saw an old university friend of my wife’s for lunch with her new beau, Max did have a playmate his age there. The beau was from Argentina, and has a small son. What has happened here? My wife is part of a baby boom generation that has faced a historical whipsaw, from excessive optimism and sudden affluence to a failure of confidence in Europe and a sudden loss of security. When Franco, that crusty old Spanish fascist, died in 1975, my wife’s mother and her friends could finally join the 20th century. They had large families. Those kids grew up in an era of social reconstruction and torrid economic expansion. Jobs were easy to find, and growth seemed inevitable. In the 1990s, people ascribed falling birth rates in Spain to an embrace of modernity and prosperity. But by the early 2000s, that boom overheated. Spain’s young men left high school to work as builders. In 2004, a young man could make $40,000 a year swinging a hammer, double what his father earned. Compared to the men, the women stayed in school, targeting secure jobs in the public sector. Career counselors would tell new college grads to earn the equivalent of tenure within about a decade, and in many cases such new opportunities for women delayed childbirth. A 30-year-old woman could then settle down with her future assured. When my wife and I met in 2006, she was working for the government as a librarian, patiently acquiring “points” toward her tenure. Three years later—about the time we started thinking about kids—the bubble had popped. Spanish unemployment soared to Depression-level numbers: 50 percent for under-25s. All those guys who’d dropped out of school had neither jobs nor degrees. My wife and her friends were the age their mothers were when Franco died and the Spanish miracle began; now they were going to watch it unravel. As the crisis dragged on, the future failed to materialize. Unemployment was still nearly 30 percent in 2012. If you were single, you had to be very lucky to meet a man or woman capable of being an equal partner in the family’s financial or emotional stability. Max came along when the crisis was nearly five years old. We weren’t necessarily more optimistic than most Catalans, but you can’t always let macroeconomics dictate your life. Plus, mixed marriages like ours do have the advantage of a hedged, diversified bet. Our family would live in Barcelona, but I would not be solely dependent upon the local economy—I am able to work for clients abroad. I do not believe my wife married me in 2009 for my blue passport, or agreed to have a child with me in 2012 for it. Nor did I marry her for the free health care or automatic residency in the rest of Europe. But I can certainly report that we married with the understanding that her passport gave us access to European social services, and mine gave us access to the United States and its economy. We’re betting that being binational will be an advantage in the future. Where my New York grandparents went out of their way not to teach me any of the Russian, Romanian, and Yiddish they spoke, we are insisting Max speak Catalan, English, and Spanish. Rather than encourage him to have a national identity, we are encouraging him to have a transnational one. He’ll need to find stability for himself over and around borders. I also want him to be able to see both his homes with a foreigner’s optimism. When his mother complains that ticket prices for Spanish trains have soared 200 percent, I want him to marvel, as I do, at how well they work anyway. Spain, even in its lowest moments, still feels like a miracle to me, with its low crime rate, healthy diet, and long, generally happy lives. And I hope he has a European’s fascination with American indifference to obstacles, the can-do culture that feels like a cliché to me, but is clearly part of my makeup. I’d like to think that as Max moves on from his crocodile phase, the EU will move on from these vicious discussions about borders, migrants, and viruses. Someday there will be enough Maxes in the schools to make the borders—and the arguments—less meaningful. Marc Herman is the author of the nonfiction Kindle Singles The Wizard and the Volcano and The Shores of Tripoli. He co-founded the journalists’ cooperative Deca. Primary editor: Lisa Margonelli. Secondary editor: Andrés Martinez. *Photo courtesy of Gveret Tered/Wikipedia.